The dispute succeeded in pushing the development of a West Duluth park to the top of the board’s priority list, and its members began searching for a suitable site. By December 1900 the board had identified four areas, and a group of West Duluthians met to consider the options. The group settled on a forty-acre tract along Kingsbury Creek near Seventy-second Avenue West, which was available for $4,000. The park board accepted the group’s recommendation and purchased the land in March 1901. Kingsbury Creek’s name came from pioneer William Wallace Kingsbury, a Pennsylvania native, who had established a homestead along its banks in the 1850s. Kingsbury represented northeastern Minnesota as a member of the Territorial House of Representatives in 1857 and served as a delegate to the state Constitutional Convention. That same year the Democrat was elected to congress. By 1865 he was back in Pennsylvania; he died in Florida in 1892. The board promptly started work on the new park, which was christened Fairmount Park in response to a request submitted by the Fairmount School Alumni Association. Almost immediately newspapers and even the park board members began misspelling the name as “Fairmont,” an error others have perpetuated to this day. The News Tribune reported, “The new park…will not need as much work as the others about the city owing to its splendid natural advantages. …A little stream tumbles through a rocky chasm included in the park, and when the rains come the purling brooklet is suddenly transformed into a torrent, its water deep, treacherous, foaming, and to lovers of the harsh and wild in nature is then one of the most inspiring sights in this region.” Park employees built paths and installed benches, and—although the streetcar extended only as far as Fortieth Avenue West—Fairmount Park rapidly became popular for family outings and picnics. In June 1903 an official entrance was constructed for the park and work started on a pavilion. Because of the ongoing citywide controversy about the evils of dance halls, the board had to assure worried neighbors that the pavilion was only intended as a picnic shelter. When the street railway company finally extended the streetcar line all the way to the park in early 1905, Fairmount became a favorite summer picnic site for groups ranging from Sunday school classes to the Sons of Norway. 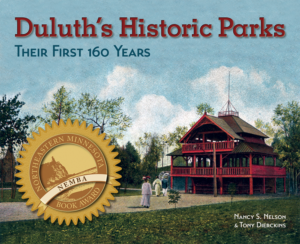 Many labor unions also held their annual picnics at Fairmount Park, and in 1906 the Duluth Trades Assembly formed the “Union Labor Park Pavilion Association” so union members could build their own facilities. Using money donated by members of the various unions, the association purchased sixteen lots adjacent to Fairmount Park and went to work building a pavilion and sports fields. The association hired an extra crew of workers to get the pavilion completed in time for the 1906 Labor Day picnic, which featured tight-rope walker Henry DeRouch and a balloon ascension by aeronaut Professor R. Thompson. According to the News Tribune, at least three thousand union members marched in the Labor Day parade and ten to fifteen thousand people visited the park grounds. In 1909 the Duluth, Winnipeg & Pacific Railroad submitted a plan to construct a new line into Duluth. The proposed route of the track cut through the northern portion of Fairmount. Despite protests from citizens, the proposal was approved by city leaders. As part of the agreement, the park board required the railroad to donate a ten-acre parcel of land adjacent to Fairmount Park in exchange for the land lost to the right-of-way, expanding the park to nearly fifty acres. The wild beauty of Fairmount was diminished somewhat by construction of the railroad, but in spite of the intrusion the park’s popularity continued to grow. 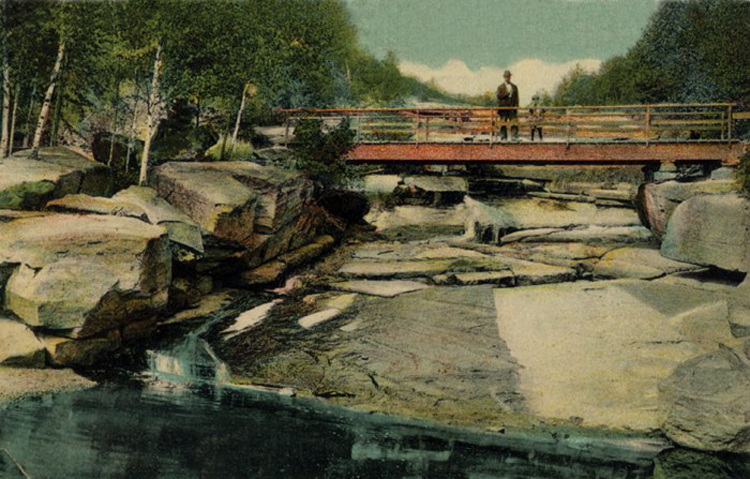 Duluth’s park system in 1911 included seven major parks totaling nearly 250 acres, but none provided a swimming beach or public access to the St. Louis River. Members of the West Duluth Commercial Club began agitating for the park board to remedy this by expanding Fairmount Park along Kingsbury Creek all the way to the river. The board agreed to the idea, but making it a reality was more difficult than expected. At the board’s prompting, in late 1911 the city council approved the issuance of park bonds to raise money to purchase the land along both sides of Kingsbury Creek. In early 1912 the city began condemnation proceedings on forty acres, extending from Sixty-third to Seventieth Avenues West and including a piece of land along the river known as Indian Point, nearly half of which was underwater at the time. Real estate appraisers valued the land at roughly $26,000. Property owners representing ten acres agreed to sell, but owners of the other thirty acres were not satisfied. They wanted $2,000 per acre, arguing that the land had potential for future docks and manufacturing plants. They refused to sell and appealed to the district court. The case was settled in January 1914 when Judge Josiah D. Ensign ruled that the appraised value was fair. Still unsatisfied, the landowners appealed to the Minnesota Supreme Court. By this time World War I had erupted in Europe, creating what the newspaper described as “financial quietude” and a drop in land prices. Recognizing defeat, the landowners abandoned their appeal and finally agreed to sell. The city succeeded in purchasing the additional forty acres for Fairmount Park in early 1915. Cleveland also banished “form-fitting” bathing suits, but was willing to consider public opinion on what type of suit would be acceptable. He told the News Tribune, “Personally, I think all bathing suits must have skirts, but let’s hear from the people.” Despite his conservative viewpoint, he had a great sense of humor, and in March 1915 he announced a contest to design the best “appropriate” bathing costume for women. He offered a prize of five dollars for the winner. The guidelines were to “send in just the kind of costume you think would look the ‘nicest’ and still ‘get by.’ But don’t make your drawing too bold.” For the next two weeks, sketches of bathing suit designs filled the newspaper. To evaluate the fifty entries, Cleveland put together a judging committee of nine women who represented all sections of the city, from Lakeside to Fond du Lac. According to the News Tribune, Cleveland met with the judges at Southwick’s Soda Fountain and “over steaming chocolate, salads, and other dainties to be provided at the captain’s expense” the designs were turned over to the committee for a decision. On April 8 the women met at the home of the committee chair, Miss Jean Poirier, to make their selection. They chose as the winner a “statuesque” design from Mrs. M. P. St. Pierre. The committee reported to the News Tribune that the swimsuit “was the most practical and artistic design, commensurate with modesty, of all costumes submitted.” Cleveland planned to have several hundred of the bathing costumes made in Duluth by local knitting mills for renting to bathers who did not have their own. To prepare for the official July 4 opening of the beach, Pulaski Street was surfaced with gravel to provide access for horse teams and automobiles. Cleveland installed two dozen metal dressing booths (twelve for women and twelve for men) and a thirty-foot tent pavilion for lounging and refreshments. Roland B. Reed, a former swimming instructor at the YMCA, was hired as the “natatorial supervisor” for forty dollars per month to provide free swimming lessons for children and adults.